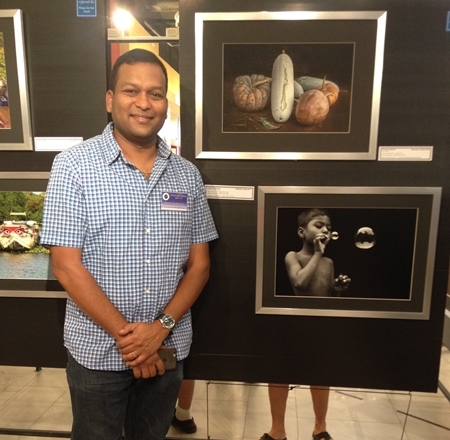 The always excellent Chiang Mai Photographic Club exhibition opened at Maya Lifestyle Shopping Mall on January 24, 2015. The 7th annual exhibit features works from photographers in Chiang Mai. The huge range of photos covers not just local landscapes and topics but fabulous photos from around the world. The exhibition is on the 3rd floor of the mall and will run through to February 8, 2015. Here is photographer Sundil Kumar beside his photo of a boy blowing a bubble. 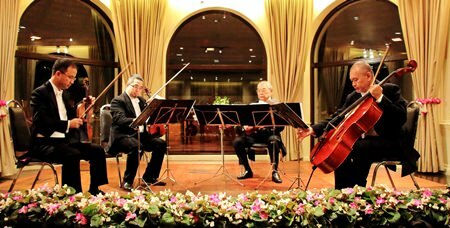 Following on from two very successful seminars on worldwide songs given last year, and where around 15,000 baht was raised to buy musical instruments for a school in Samoeng, a new venture of a similar nature was launched on Monday January 19th. Organised and hosted by Norm Robinson with support from Chiang Mai resident musicologist JP, a group of 20 people met to share the songs that they loved. This time, instead of a fixed agenda by the organizer, the songs were all chosen by the audience in advance, put on to CD and the words projected on to a screen with English translations for those in foreign languages. This was the hard work done in advance by Norm and was greatly appreciated by the enthusiastic audience. The songs were wide and varied and included music from North America, Europe, the Middle East and Australia. Most of those choosing a song introduced their choice beforehand and Norm had very thoughtfully placed interesting snippets focusing on a variety of musical issues between each presentation. If the notion of talking about a song is not appealing then people may still come along and just listen or they may make a selection and someone else will introduce their choice. It’s a great way to relax comfortably, enjoy marvelous music in the company of like-minded people and at the same time in the knowledge that the event will be helping others less fortunate. Do make contact – your presence and contributions will be received with pleasure.